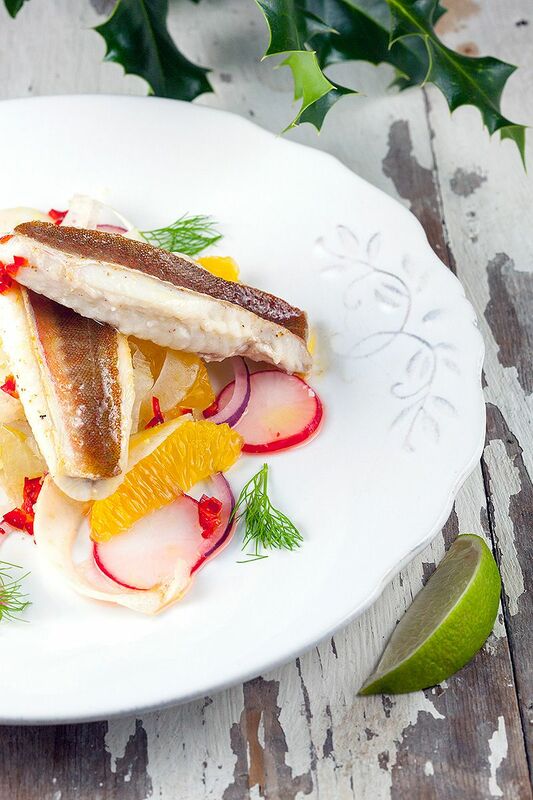 Refreshing combination of fennel, radishes, orange and red pepper in this pan-fried gurnard salad recipe. Ready in 15 minutes. 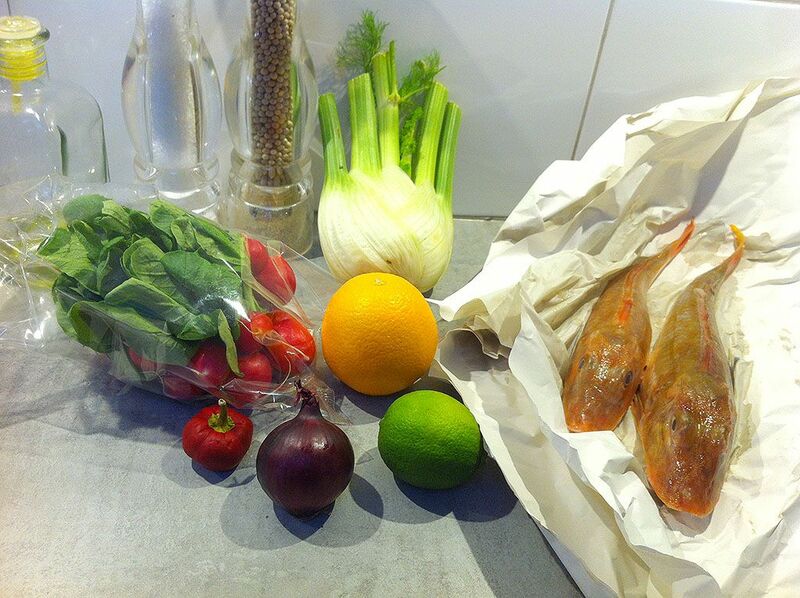 *note: you can also use red snapper or red perch instead of gurnard fish. If you bought a whole fish, you have to start filleting the fish. Start at the head and run your knife towards tail and remove the fish bones using tweezers. To be honest, if you get the hang of it, it’s very easy. Then for the salad itself, SLICE the fennel as thin as possible to get it extra crispy. You can use a mandoline, or even a vegetable peeler for this. Did you know that keeping them in water with ice cubes for later use, the thinly sliced fennel will stay fresh and becomes really crisp? CHOP the red pepper, with or without seeds to your liking, as fine as you can. SQUEEZE the lime and create a simple dressing by adding the chopped red pepper, salt, pepper and a little bit of olive oil to the lime juice. PEEL the red onion and slice in half. SLICE the red onion into thin half rings. Use a sharp knife to trim as much of the orange peel and white skin (pith). Then cut the segments out, as close to the membrane as possible to create beautiful orange wedges. RINSE the radishes and trim both sides off, then cut the radishes in slices. SEASON the fillets with pepper and salt. ADD olive oil to the medium-sized skillet and place the gurnard fillets in the skillet while it’s still cold. Now heat it up to medium heat. COOK on both sides for about 2 to 3 minutes, depending on the thickness of the fillets. Don’t cook them for too long, you want them to be just well cooked, not overcooked. 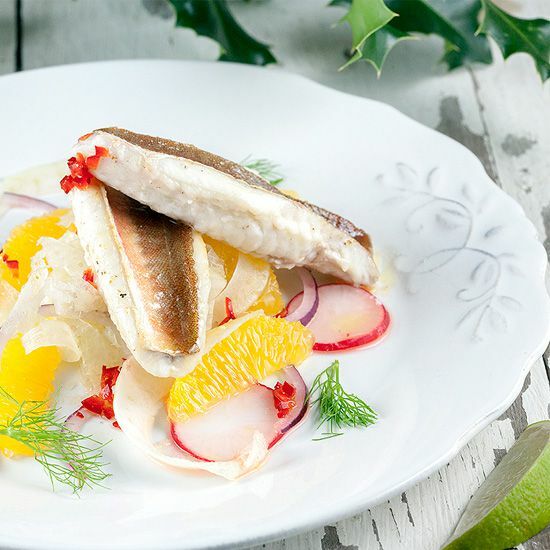 DIVIDE thinly sliced fennel, red onion, orange wedges and dressing over 2 plates. 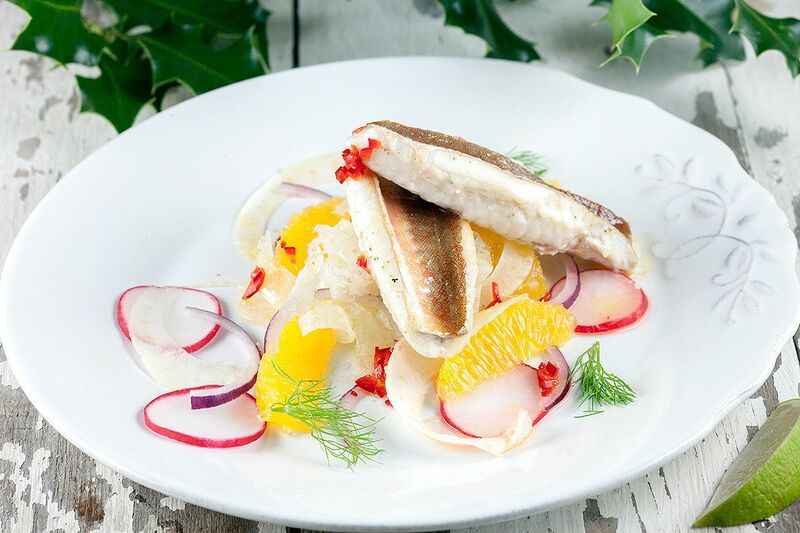 PLACE the gurnard fillets on top and enjoy this refreshing fish salad!